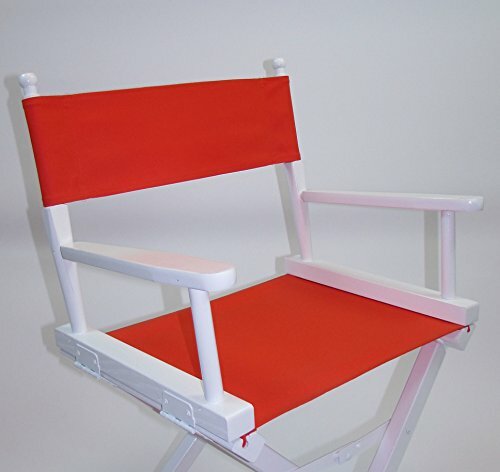 CUSTOMIZING INSTRUCTIONS - Simply click "Customize Now" to begin personalizing your new chair! We offer one line of text included with the chair in your choice of many fonts and colors. In the Location of Inscription box, type in either Front or Back. Type in your inscription exactly as you want it on the chair, we will personalize it exactly as it is typed. If you would like to add an extra line, you MUST choose Yes from the dropdown box under "Would you like an EXTRA line of text." Enter in all of your extra line information in the EXTRA LINE of text box. If you would like it on the same side as the INCLUDED line, choose "Under the included line" and we will center both lines on the same side. If you would like it on the opposite side, choose "On other side of the chair". If information is entered here and you have chosen NO in the "Would you like an EXTRA line of text?" box, all of the EXTRA LINE information will be ignored. HAPPY PERSONALIZING! EMBROIDERY DESCRIPTION Embroidery is a traditional form of personalizing items by sewing with thread the inscription that you would like. Embroidery produces a raised, elegant and durable result. We try to sew the inscription as large as possible while keeping the number of stitches within our allowable range. CHAIR DESCRIPTIONThe Contemporary Directors Chair offers value and quality at a great price. We stock and ship from our warehouse, so you can be assured of quick delivery. This chair is made in the USA from locally managed Appalachian beech hardwoods. All joints are hand fitted and glued with steel underpinning to insure tight and long lasting rigidity. Strong joints are the most important factor in long lived director's chairs. Seat and Back fabric is heavy duty 16 oz. cotton canvas which is washable and colorfast. Finally, this chair has a 3 year limited warranty against manufacturing defects. FREE PERSONALIZATION! ONE LINE OF TEXT, UP TO 24 CHARACTERS, WITH YOUR CHOICE OF FONT AND LETTER COLOR. We also offer logos and additional lines of text. Please call us for pricing and additional information. PLEASE NOTE: The customization image is only a representation. Actual appearance may slightly differ. View More In Directors Chairs. If you have any questions about this product by TLT, contact us by completing and submitting the form below. If you are looking for a specif part number, please include it with your message.